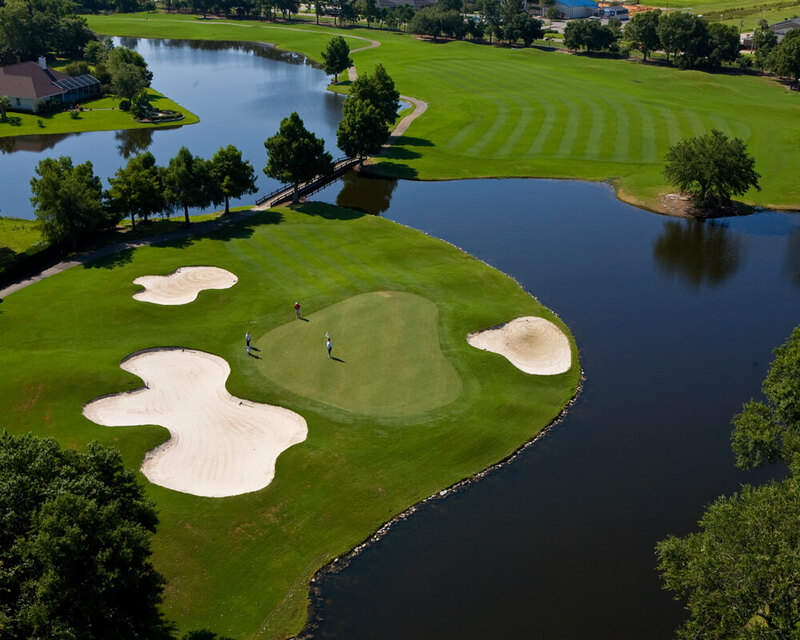 Located in Gulf Shores, Alabama, Craft Farms Golf Resort offers two signature Arnold Palmer designed courses and will guarantee a stress-free event that exceeds expectations and is remembered for years. On top of the ease of planning an event with us, the game of golf presents a wonderful way to please everyone who enjoys the beauty of the outdoors and the thrill of competition. There is no better place for a group golf outing or tournament in the Gulf Coast, Alabama area! Bring your group, whether it’s a wedding party, special groomsmen golf outing, corporate outing, conference attendees, non-profit fundraising tournament or even just a group of friends on vacation! No matter the reason, consider booking your group golf outing package at beautiful Craft Farms Golf Resort in Gulf Shores- just minutes from Orange Beach. Golfing groups of 24 or more are eligible for special group rates. We offer a variety of complete hassle-free event packages to choose from or we will customize one to fit your specific needs. Our golf outing services can range from supplying the awards, shirts, balls and other supplies for self-managed events, through total in-house outing management. We'd love to host your group this year! From the moment you and your group arrive at Craft Farms Golf Resort, our bag drop staff will be there to greet each of you in front of our Clubhouse. Our staff will assist in transferring you and your guests’ golf bags from your vehicles to your personal golf cars. The bag drop attendant will then hand you off with distinctive direction to where the golf shop is located and to whom you will be meeting when you arrive there. Tournament preparation and set-up that is so vital to a well-organized event is exemplified by our staff. Our staff will provide tournament scoring items such as scorecards, score sheets, rules and pairings, professional event scoring, and handicap service. We will also provide customized cart plates with player name and tournament name and all set-up and staging. Assistance with signage includes Welcome Banners, sponsor and corporate signage with hole assignments, special event markers and personalized cart signage. The golf shop is where each member or the leader of each group will check in. This will aid in determining if everyone that is scheduled for the event has arrived and is ready to undergo the Craft Farms Golf Resort golf experience. Our knowledgeable golf shop staff is eager and willing to assist any customer that would be of interest in purchasing from the extensive array of merchandise and club rentals. Our Golf Shop stocks many items for gifts, prizes, raffles, goodie bags and silent auctions such as golf shirts, hats, golf balls, tees, clubs, and gift certificates. The Golf Shop can assist you in ordering merchandise with your company logo. Let us coordinate your contest and prizes including: Longest Drive, Shortest Drive, Beat the Pro, Beat the CEO, Chipping Contest, Closet to the Pin, and more! During the event, a designated registration area will be set up for you including tables, chairs and linens. You and your guests will have access to our practice facility. Before your round you may practice your game on the driving range, which has several target greens, chipping greens, practice bunkers and an expansive putting green. Experienced, PGA Professionals are on staff and available for pre-tournament lessons, tips and clinics. Men’s and Women’s locker rooms are available to all tournament participants to change or shower before and after your tournament. Minutes before the tournament, one of our golf professionals will welcome your group to Craft Farms Golf Resort. The format, rules of play, and any special announcements will be made at this time. Following announcements each group will be led out to their assigned starting holes. Audiovisual equipment for guest speakers is also available. There will be two beverage carts servicing your group throughout the day. The beverage cart will be fully stocked with both alcoholic and non-alcoholic refreshments as well as snacks for your enjoyment. Our hosts will be on the golf course to create a memorable experience. Not only will they monitor the pace of play, but they will also provide your group with ice-cold refreshing towels to cool down with on those hot summer days. When finished with your round an outside attendant will be waiting to assist each participant. As each golfer comes in the attendant will clean your clubs and place them at the bag drop to be picked up. At the conclusion of the round each group will bring their scorecard to the scoreboard where a golf professional will be posting scores on your very own custom scoreboard. After your round, relax while tallying up those scores and let us satisfy that hunger. Our friendly staff is happy to meet your groups needs including breakfast buffets, barbecues on the patio, boxed lunches, grilling stations on and off the course, luncheons or hors d’oeuvres. We do everything from hamburgers, hot dogs, and chicken wings to any of your favorite gourmet snacks. Let us bring that final touch to your round!!! Contact the golf shop now for more information on golf group rates or discounts at 251-968-7500.